We are celebrating our tenth anniversary as the enthusiastic, quality driven beauty retailer you have come to know and love and we couldn't be more thrilled or more honored. You've seen the sales around the site (and our Instagram feed, Twitter account and Facebook page), but did you know we are also throwing a party? WE ARE! And you're invited! If you are going to be in or around Austin, Texas on September 24th (or if you want to fly out especially for us), please join us at Cielo on South Lamar for an evening celebrating a Decade of Decadence. We are thrilled to have partnered with Dress for Success to bring you an event that highlights our local presence, the excellent work that Dress for Success does, and you, our lovely customers. Please consider bringing new or lightly used business attire for donations to Dress for Success. 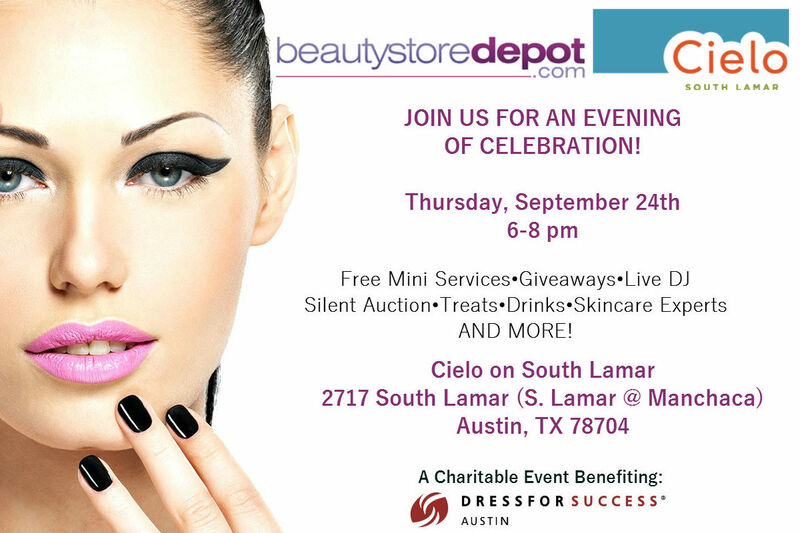 Please join us for drinks, treats, a live DJ, giveaways, a silent auction, free skincare consultations, free facial scans and MORE! We want to spoil you! Beautystoredepot is celebrating, and we want you to come play with us!